Cleaning up an RV is certainly a daunting task. And unlike a car, you have to deal with a much larger surface area, both on the exterior as well as interiors. And dirty RV interiors can have a severe impact on your health as well since it is also your living quarters for the duration of your RV journey. But fear not, for, with our detailed RV cleaning tips and guidelines, you can make your RV shine as good as new! In the daytime, water spotting can be an issue while cleaning your RV exteriors. And unless you are fortunate enough to have a covered parking area for your RV or trailer, your best option is to clean the RV in the morning or evenings. We highly recommend that you take things forward in step by step manner. The best option is to start with the roof. Otherwise, you will have to deal with dirty water running down you already cleaned surfaces. Only move on to the sides, front, and rear once the roof is clean and dry. Starting with the roof also allows you to clean the most exposed part of the RV first. You cannot hope to clean an entire RV without some help from the right sort of cleaning tools. At the bare minimum, you should have a brush head and water blade, both mounted on poles for extended reach. Look for brush heads with soft synthetic fibers to protect the clear and gel coats on your RV. Also, equip yourself with some good quality drying towels. And of course, you will need a good quality car wash shampoo to clean the RV. You don't need us to remind you about the size of your RV. To reach all the surfaces and roof, you will have to use ladders. If you are not physically fit, or good with heights, this job is best left in the hands of others. If you fall off the roof, you could get seriously injured. Use shoes with good grip to avoid any falls from the roof of your RV while cleaning. Boating deck-type shoes are perfect for this task, due to their nonslip grips. Never rush things in this job, as that can lead to mistakes and falls. Often it is better to have someone around to help you with the cleaning process. 3. What if You Live in a Water Restricted Area? These days, access to water might be a problem. Back at your home, it might be due to water restrictions in your neighborhood. Out on a campsite or boondock, it might be due to lack of a nearby water source. In these instances, the best option is to use a waterless wash and mop system. You can clean and maintain your camper without a hose or pressure washer. RVs usually have one of two main types of roof surfaces. Yours could be either fiberglass or EPDM/TPO, which is a form of rubber membrane. If you have fiberglass, you don't have to take any extra precautions. But the EPDM/TPO surfaces require some extra care. Rubber surfaces are vulnerable to petroleum distillate compounds. These are often core ingredients in strong cleaners and chemicals. Using such compounds will dissolve the rubber and break down your roof surface. Beyond that, the cleaning process is fairly straightforward. Wash with water and a good quality shampoo, then rinse and dry. If you want, you can add a special layer of roof guard protectant to your rubber roof. This is simply an optional process, to make future maintenance hassle-free. Fiberglass, though durable, tends to oxidize if left without a protective layer. Oxidised roofs have a distinct chalky appearance. In this event, you will need an ultra-strong cleaner to remove that oxidized layer. Once the roof is dry, don't forget to look for any cracks or tears. All RVs have some common hotspots where dirt and grime tend to accumulate over time. The rearward side panels are often the worst affected, along with the front and the back. Start with one side and finish it before starting the other side. And by "finish it," we mean rinse, clean and dry it thoroughly. Avoid cleaning the wheels and tires with the same mop that use for the sides. It will get too dirty. If you use that mop to clean the other sides, you may end up damaging those surfaces. One all sides have been cleaned; you need to apply some protective coating. This portion of the RV will see a lot of bug strikes during road trips. Removing all those squashed bug carcasses can be a real challenge! To remove them effectively, wet the area and then apply a dryer sheet. To clean those hard to reach areas, put the dryer sheet on a long brush and scrub the surface. Often, you can make your task much easier with a simple preventive measure. A heavy wax coating makes cleaning much easier. So apply a generous dose of wax on the front of your RV. These areas tend to have harder mud, dirt, and grime. So you will need a combination of a stiffer brush and a high-pressure water jet for best results. You will have several hard to reach surfaces to deal with here, including landing jacks, suspension parts, slide rails, and stabilizers. If you can apply a dry type lubricant on these surfaces, it will make future cleaning operations much easier. On the wheels, use a generous amount of soap and water. Applying a UV protectant on the rubber is an excellent idea. For general cleaning, a simple combo of soap and water is best. After wiping those windows, apply a coat of Windex glass cleaner. Apply a protectant rubber conditioner on al, the rubber seals, and slide outs. Inspect all these seals, slides, and bug screens for any tears or damages. 9. Do I really need to wax my RV, Camper or Trailer? Yes, yes, a hundred times yes! All RV surfaces are vulnerable to oxidization when exposed to the sun and elements. This includes fiberglass, plastic, gel coat, and clear coat paints. Oxidisation affects the overall appearance of your RV and also degrades the surfaces by making them brittle. You have to options to prevent it; one is to wax it. An alternative is to use a sealant. Waxes are comprised of natural and organic components and have a relatively shorter lifespan. You can expect these to last for a few months at best. Sealant, on the other hand, is made from synthetic compounds. Some sealants will last for almost a year. If you want lasting protection, sealant is the recommended product. But for those wanting a better-looking surface, wax is the preferred choice. Regardless of your choice, you should apply either of these products to enhance the longevity of your RV exteriors. What is the best wax or sealant for an RV? The choice of best wax or sealant is entirely dependant on the kind of surface you have on your RV. Fiberglass and rubber surfaces require different products for best results. Check the next section for detailed answers. What is the best wax for RV fiberglass or gel coat? Waxes and sealants are both further divided into two different categories. Cleaner Waxes & Sealants - they contain abrasives and solvents. These are effective in dissolving and removing oxidation from RV surfaces. They can help smooth out any imperfections in the surface as well. Finishing Waxes & Sealants: They do not have any abrasives or solvents. They will offer a protective coating on your RV surfaces though. If your RV fiberglass surfaces show heavy signs of oxidation, a heavy-duty cleaner wax or sealant is what you need. But if the surface looks free from any blemishes, apply a generous coat of sealing wax or sealant instead for protection against future oxidation. What is the best way to apply wax or sealant to an RV? If you have the energy and grit, you can always try to apply the wax or sealant by hand. But RVs are extremely large, with a wide surface area to cover. So the best option is to use a dual action buffer. These buffers are also extremely safe. But another less strenuous method involves using a mechanized too, called a dual action orbital polisher. This power tool can be used for paint corrections and sealant application on all sorts of vehicles, including cars, trucks, and RVs. For best results, you can combine this tool with a waxing flat pad. Whatever your preferred method, always check the bottle of wax or sealant for directions. In most instances, it involves applying the wax to the surface using a soft cloth. Allow it to dry, and then buff it using a soft towel. These days, bare metal surfaces are very uncommon on most RVs. On the vast majority of surfaces, you will find polished metal. They usually have a powder coated or clear coated finish. For these surfaces, you don't need any extra steps for polishing. But in the case of bare metal, you will need to take some precautions. First of all, you have identified the type of metal surface on your RV. To do this, apply a small quantity of metal polish on an inconspicuous part of the metal surface. Use a soft cloth. If it is bare metal, the cloth should turn black in a short while. With clear coated surfaces, there will be no change in color on the cloth. For bare aluminum and other metal surfaces, use a soft microfiber cloth and some good quality aluminum metal polish. Apply the polish and rub it with the cloth until it turns black. Then use a clean cloth to wipe off the polish. Repeat this process several times for best results. RV owners often ignore their tires when it comes to regular maintenance. This is both wasteful and dangerous because it can lead to frequent tire changes, and increase the risk of tire failure and accidents. For improving the safety and longevity of your RV tires, you need to do more than basic cleaning. You need to protect the rubber against ozone and UV rays. Both are agents of decay and destruction as far as all tires are concerned. Tire manufacturers do add some protective chemicals to modern tires. But these chemicals are located inside the tire, and will only find their way to the exterior with regular usage. And in the case of RV tires, we all know that this does not happen in most cases, not even when you are a full-time RVer. The best thing you can do for your RV tires is to apply a coat of UV shield spray. Try to avoid tire dressing sprays that contain petroleum distillates, alcohol, and silicone. They can do more harm than good. Look for water-based products with UV inhibitors. These will actually protect your tires from UV radiation without affecting the structural integrity of the tire surface. Cleaning the exterior of the RV helps to keep it looking shiny and new. It also protects the surface panels against damage and helps to maintain the resale value of the RV as well. But the cleanliness of the RV interiors can have a more direct impact on your health and well being. Living in such a closed and cramped environment can lead to a smelly and downright filthy interior. That is unless you take regular steps to clean and sanitize the interiors. Removing dirt and dust is a real chore, we agree, but it is an essential and unavoidable one. To comprehensively remove the dust from your RV interiors, you should use a trio of tools: a duster with long handle, a shop vac, and a compact handheld vac. With these three tools, you can clean all the surfaces, including the really cramped and hard to reach corners. After using the vacuum on kitchen surfaces, apply Windex or ammonia water to disinfect them. Windows, Mirrors and Window Treatments. To clean plain/regular window surfaces, use Windex and a soft cloth. But first, check if any of these surfaces have a coating of solar film. If they do, they might be vulnerable to some chemicals found in cleaning products like Windex. Check your user manual or manufacturer directions for guidance on proper cleaning of these surfaces. Remember to clean both sides of the windows. Cleaning mirrors inside an RV is a simple process. You can use the same methods you employ inside your home. But curtains, blinds, and shades can present some challenges. Stained roll-up shades should be cleaned with a damp cloth and some Windex. Wipe the affected surface with these products. For unstained roll-up shades, use a duster. For regular shades, use either your vacuum or hand duster. For shiny aluminum blinds, you only need to do some light dusting as those surfaces do not attract much dust. For blinds made from other materials, you will have to use mild detergent and a mop. Do this cleaning after removing the blinds and laying them on the floor. Day-night shades are very fragile and prone to. Breaking. Use extra care while vacuuming them. Wipe them gently with Windex and a damp cloth if they have any stains. Curtains with water stains should also be treated with Windex and damp cloth. Or else, you might have to send them for professional cleaning. First, vacuum the entire dash area using a vacuum. Use a handheld vac to reach the tight corners. Then clean all the vinyl or leather surfaces using an appropriate protector. This also includes the foot pedals and the steering wheel. For fabric upholstery, spray some Febreze after vacuuming. Then cover the surface with a throw blanket. Consider calling a professional once a year to steam clean all the upholstered surfaces. Focus on using cleaning and disinfecting the toilet and bathroom area. Try to avoid using products that may cause physical damage to the surfaces in the toilet. These include harsh brushes of any sort and any rags with harmful chemical residue. Cleaning the RV toilet is a weekly task, at the very least. If you have an entire family living in the RV, you should clean the toilet more often. It is quite clear that you don't need a lot of specialized equipment or cleaning products to clean your RV toilet. An effective disinfectant cleaner and some soft material are all you need. Add some cleaner and water to the toilet bowl. Clean and disinfect the rim using paper towels and cleaner. RV showers are not like the showers in your home. They use lightweight and relatively fragile plastic parts inside the RV. If you use the wrong kind of products, you can damage and scratch these surfaces. Scratches then become breeding grounds for bacteria, dirt, and algae. They will eventually ruin the floors as well. To protect these surfaces, the best option is to do some routine maintenance. With some simple cleaning measures after every instance of using the shower, you can reduce the chance of long-term damage. Use a dry towel or squeegee after each shower to wipe all surfaces clean. If there are any glass surfaces, apply some Windex or ammonia. You can also use a gentle cleaning agent on all shower surfaces/bathtub. For other surfaces like sinks and countertops, use Original Windex and paper towels. Apply a germ spray afterward on all surfaces to disinfect them. Use ammonia water or pine-based cleaner on the floor to mop everything clean. Holding tanks in RVs are extremely vulnerable to germs. If you allow these bugs to thrive, they can pose a severe health risk to anybody who lives in the RV. Cleaning and disinfecting the sewer tank is a particularly arduous and hazardous task, because of the noxious fumes it produces. Cleaning these tasks is no simple task, and cannot be easily explained here. You should consult the owner’s manual for more detailed instructions and guidelines. You can also find detailed assistance on online RV forums. We always complain that RV floors do not have enough space. Yet these cramped spaces are harder to clean than the wide open floors in your homes. Use the following focused techniques to get the best results while cleaning RV floors. For laminate floors, use a dry mop, lightly misted with a mix of water and vinegar. Use a microfiber mop for best results. For vinyl or ceramic floors, use either ammonia or ammonia water. Carpets should be steam cleaned, professionally is possible. Vacuuming them can be a chore and can be avoided by using protective runners made from adhesive plastic. You will have to replace those runners often, but they help keep the carpet relatively dust free. If the stairs are carpeted, cover them up using these runners as well. Use rubber mats in front of the stairs, and avoid wearing shoes once you reach the carpeted area. Sweep the floors after each trip, and clean the hard floors as well, with ammonia and water. Launder all mats and rugs as often as necessary, usually after each trip. 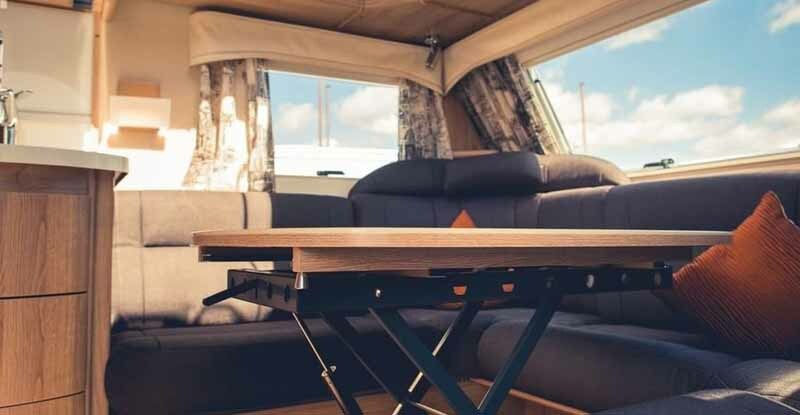 Using these RV cleaning tips, you can keep your RV looking shiny as new on the outside, with clean and healthy living environment on the inside. Complete cleaning of an RV is a tiring task, and the longer you delay/ignore it, the harder it gets. If you cannot handle it on your own, consider calling a professional cleaning service instead.